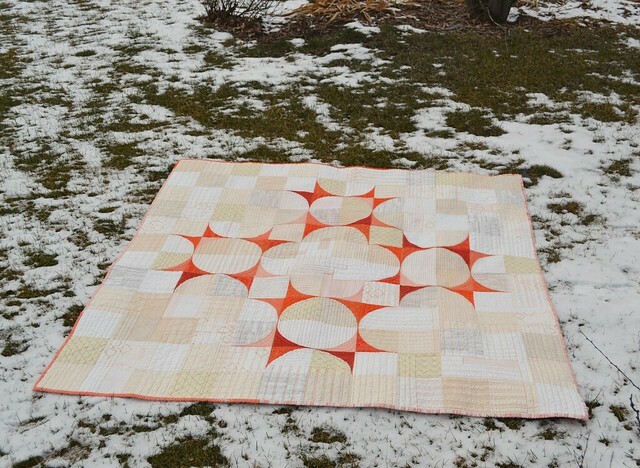 she can quilt: Spin - Ta Da! Let me tell you about Spin. After a wash and dry, she is about 56" x 58", drawing in a bit more in one direction than the other it seems. The math for the pattern gives you an un-quilted quilt top of 60" square. If you wanted it bigger it would be a simple thing to add more of the background squares. Spin is a version of my own design - a pattern I call Twirl. A minimalist medallion using the Allium block I designed when I made Echoes. This pattern will be available to purchase very soon. In the meantime, if you are impatient, feel free to just make your own version if you are able to figure her out, although I would love it if you would let me know and credit me for your inspiration. I waited just a bit too late for the best photo light, but that one above is probably the closest to right. 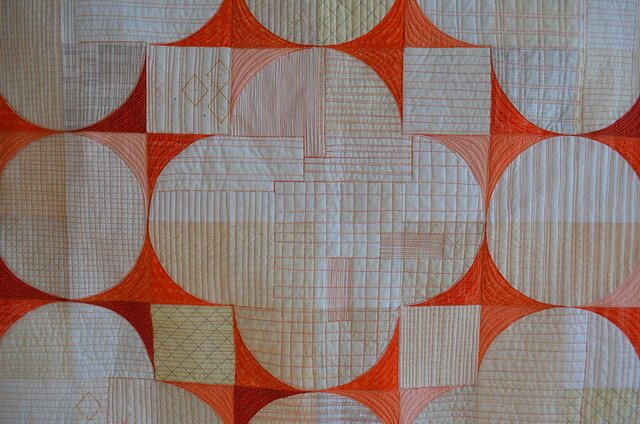 Spin was made with some wonderful orange bits and lots of low volume neutrals. There are a lot of Carolyn Friedlander prints in this quilt but several others too. 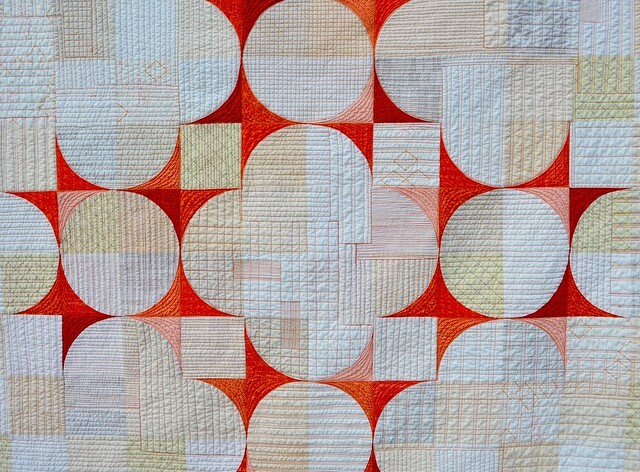 I have to say that orange is my current favourite quilting colour. 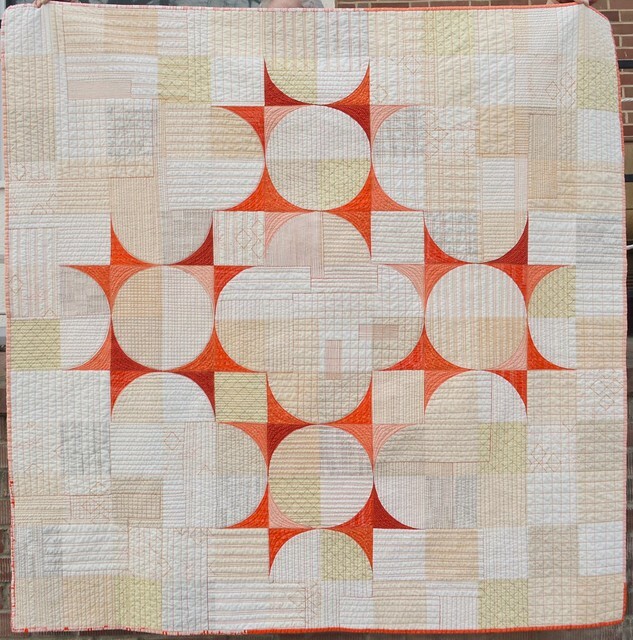 I quilted and quilted Spin. I have already written about the quilting here and here. All the quilting was done on my Millenium Longarm machine. I drew every line free hand, without the help of rulers or channel locks or markings on the fabric, and with no computer or panto either. I used 100% cotton thread for the quilting. The top and the bottom, as I quilted her used a medium orange Superior Threads King Tut - that close up above is the orange thread. The middle portion uses a Star variegated orange, pink/red thread. I used the same thread in the bobbin as on the top. I consider my style - this style - to be modern industrial - think warehouse, brick wall, rough and functional - organic, not precise. I filled the spaces with lines, every which way. For the orange curvy bits, I echoed the curves. 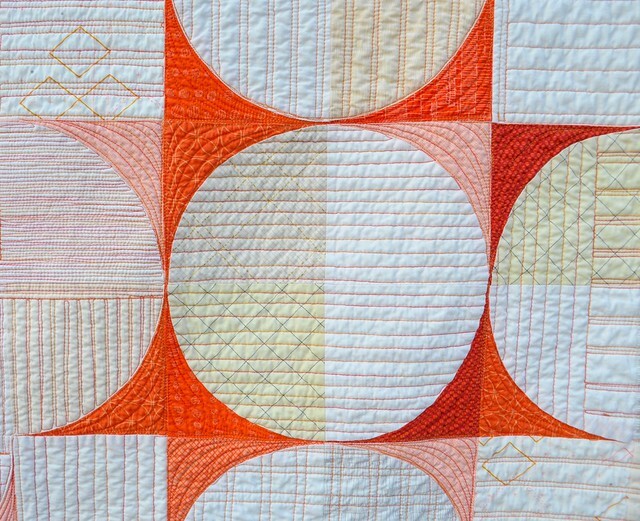 The final step to show off this style of quilting is to wash and dry the quilt so that the 100% cotton batting and thread draws in a bit and adds some texture. I prewash all my fabrics so the draw in is not from the fabric shrinking. For her back, I used four prints that I love. Two by Zen Chic, one by Denyse Schmidt and one by Suzuko Koseki. You can see the quilting well on the light prints on the back. 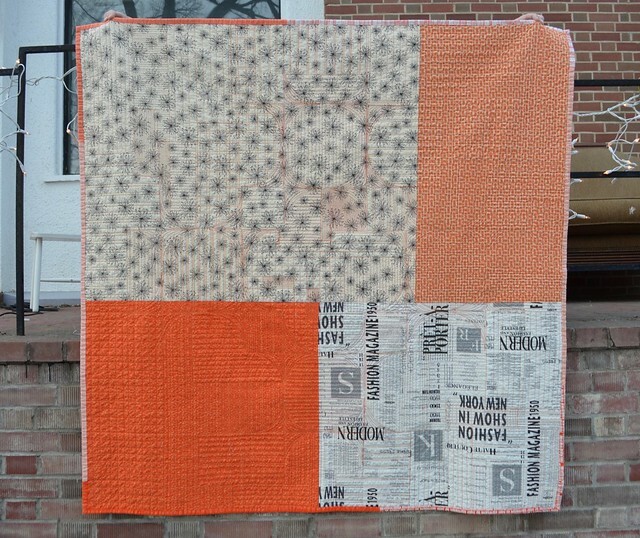 The binding is scrappy, made of 7 different Carolyn Friedlander orange prints. The above photo is before I washed this quilt. You can see the flatness in the quilting and the stiffness in the drape. There is just no way for me that the quilt is finished at this stage, this is not the look I am seeking. Here is a close up of the unwashed quilting. The quilting is easier to see but it is so less textured and dynamic. Here is another photo after the wash and dry. You can see that the cardboard-y stiffness has gone and the quilt is drapey like a blanket. This photo also gives you a bit of proportion. I am so smitten with this quilt. I am going to enter her in the Quilt Canada National Juried Show - the entry must be in by noon tomorrow. I am going to try for one more photo shoot first thing in the morning to see if I can get a better full on shot for the entry, but either way, I am hoping that she will be accepted into that show. I am off to the Lethbridge Modern Quilt Guild meeting - they will be the first quilters to see Spin in person. Thank you to all of you here and on Instagram for all the encouragement and enthusiasm about this quilt. I am already keen to make another, but I have some other designs using this block in mind too. I've linked this post up to some excellent and inspiring, sharing posts: Sew Cute Tuesday at Blossom Hearts, Fabric Tuesday at Quilt Story, Finish it up Friday with Amanda at Crazy Mom Quilts, and maybe I'll add some more links as the week goes along. By the way, Spin was on my Q1 FAL List too, so I have one finish already! I love everything about this quilt. And I agree quilts aren't finished until they have been washed. Yay for a beautiful, beautiful finish! I love this quilt! 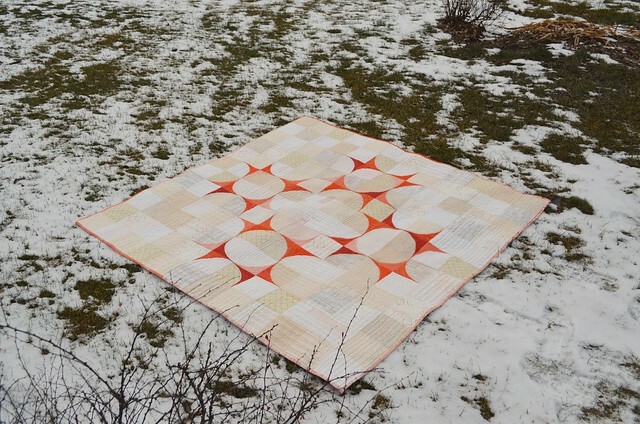 Orange is one of my favourite colours too, but I haven't done any orange quilting yet ... It looks great, and your design is very effective! Love how this quilt turned out......the quilting is amazing. The orange extension cord photo bomb is the bomb! Lovely quilt/quilting. I love love love this quilt. Orange is my favorite too. Good luck with the show. The jurors would be crazy not to accept this quilt. I said it on Instagram, and I will say it here too. I am in Love! Amazing work...just stunning. Love your style. The quilt was beautiful, but once the quilting took shape - stunning!! I have done some quilting similar, but I am in a very 'heritage' area and people just don't take to it. I loved Echoes when I first saw it, but it is even better to see your evolution of this design. Can't wait to see what else you're cooking up! Your quilting on this piece is a testament to your vision for the piece, but maybe also a bit of stamina to get all of that done to carry out your vision. Oh wow, oh wow, oh wow!!! Spin finished beautifully. Those oranges by Carolyn are just something else all grouped together, aren't they? When I am quilting a square quilt on my longarm (a circa 2005 APQS Millennium I picked up used a year ago), I have noticed that I get more shrinkage top to bottom than side to side. LOVE the orange! Your quilting choices are perfect for this quilt. I sure hope you get it into the show! Good luck! Very special quilt. Reminds me of Spirograph! Absolutely gorgeous ! I love your fabric choice and quilting design. Congratulations and good luck for your entry ! Love the quilt and the choice of fabrics, just beautiful! Beautiful quilt, love all the texture you have created. I am smitten, too. Good luck on your winning entry! You have done a wonderful job on this beauty! Good luck in the show! What a fabulous quilt. I love the colors, and your quilting suits it perfectly! I absolutely am in love with this one. This is a beautiful quilt, I especially love the quilting detail. I agree that a quilt is not finished until it's washed and dried, it evolves to another stage of development once you do. This is so gorgeous, Leanne! I love the look of the quilting, I'd really like to try something like that soon on my domestic machine. Lovely quilt! Love that orange too. I'm interested in your comments on QuiltCon. You've said you are going to enter it in the show. I'm always interested when I see someone identifying their quilt entry. I thought that most quilt shows judged entries anonymously. How is this handled when the quilts are identified on social media prior to judging? Or does QuiltCon operate differently? I love this quilt! Best of luck on your entry! I love this quilt!!! 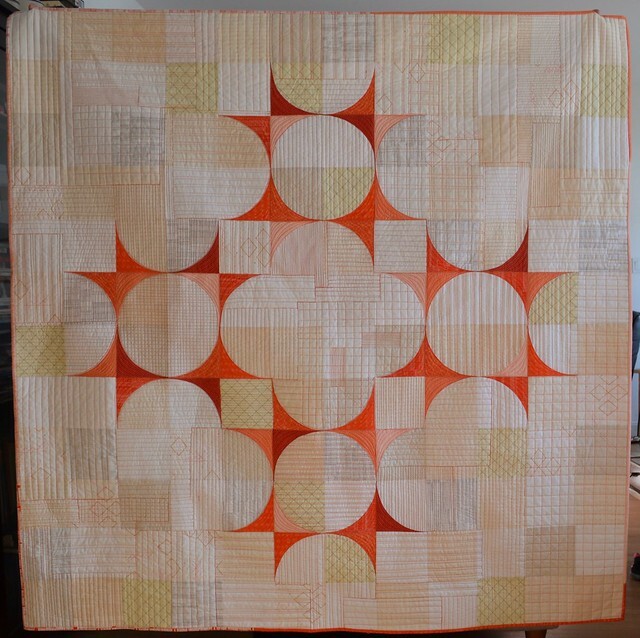 I can't believe how the quilting in the orange just sets it off....it is a WINNER! Wonderful inspiration again. Thank you for sharing. She turned out amazing. Well done!!! It's beautiful Leanne! Good Luck with the show! What an amazing job you did on the quilting. It is fabulous. I am so in love with this quilt! The quilting just makes it! Love it--both colors and quilting. Gorgeous! You have such a wonderful talent! Congratulations on a fabulous finish! The quilting is fabulous, really. Congratulations and a showpiece for sure. 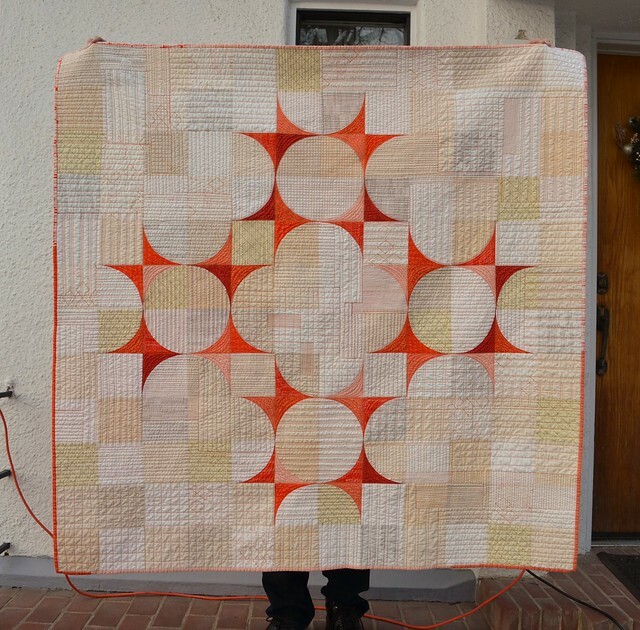 A stunning Spin quilt! Love all the bits of orange! Breathtakingly beautiful. Your choice of colors, the background beige and naturals, the gorgeous quilting add so much to this quilt. I am supremely impressed. Absolutely gorgeous Leanne! Good luck in the show - I think this girl is a winner. Been watching you put this together on IG, amazing! The quilting is so incredible, thanks for the informative post as well. Congrats on such an impressive finish! Such a great finish!! What a beautiful quilt!! I like it. A lot. The colors just speak to me in this one. Nicely done. It's gorgeous, I hope it gets in the show! Beautiful! Love the quilting and colors as well. WOW!!! This is absolutely stunning!! Gorgeous, gorgeous work. This is a lovely quilt--the colours, design, quilting--all are wonderful. I'm still too scared to try curved piecing, but this may just inspire me to try.